This has bothered me for awhile. Why does Ontario use a different pull through arrow to every one else in North America, and many parts of the world? It just seems quite bizarre to me; historical pictures show that Ontario used to use the standard FWHA arrow but switched for some reason. Personally, I'm not a fan of the arrow, but I suppose it could be worse. Finding exact dimensions for the arrow has been difficult, so sign making is especially difficult there. I loathe the Ontario downward-pointing arrow. I also disapprove of Ontario's use of Helvetica on official traffic signs, but that is a separate issue. In regard to sign mockups, isn't there a volume of the Ontario Traffic Manual that explains how to confect guide signs? There is somewhere. I remember jumping through a billion hoops to get an Ontario down arrow drawn as close as I could to real specs, and it came from a MTO PDF file somewhere. Thanks a ton Zeffy. Helps a lot. I also disapprove of Ontario's use of Helvetica on official traffic signs, but that is a separate issue. Aside from a brief experiment with Clearview a few years back, Ontario has for ages only used the FHWA type fonts. That may be true so far as green-background guide signs are concerned, but (per OTM volume 8) Helvetica is used extensively on certain types of general informatory sign, in cardinal direction tabs (either separate or within combination assemblies), etc. Serifed typefaces are also used on historic landmark signs. The following sign codes are just a few examples of those that have Helvetica: M112, M114, M115 (combination junction assemblies with provincial crowns, cardinal directions, and arrows), M302, M305, M309, M312 (cardinal direction tabs), M303, M306, M310, M313 (one-piece tabs with both cardinal direction and arrow), M203 ("BUSINESS" tab), M204 ("ENDS") tab, and so on. Oddly enough, there are "JUNCTION," "JCT," and two-headed one-piece tabs with two cardinal directions that do use the FHWA alphabet series. Oh, those supplements. Never really paid much attention to those. Unlike guide signs, they're so straightforward that it's not really much to be gained by changing the font. As an aside, the historical markers are not MTO signs. I notice some directional tabs are in FHWA, and some Helvetica. I wonder if FHWA is an old standard, or both are used now. Given how the first example is in a construction zone it probably was produced by a third party, not the Provincial Sign Shop. It certainly would be possible to change the font on the standard template, there just hasn't been much call for it. Maybe with the switch to mixed case for more of our larger guide signs it may spread to these ones on the next round of OTM updates. But that'll be a ways off at this point. Nice work Sammi. Do you mind converting that to a png or jpeg? The shield I have is low resolution. I'm used to this arrow, and seeing other arrows seems strange for me. 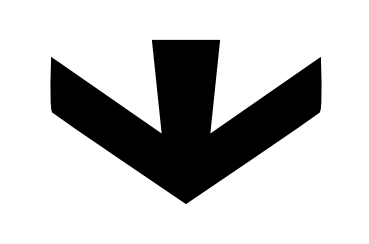 Also, I think since this arrow is only used in Ontario, it sorta makes us unique?